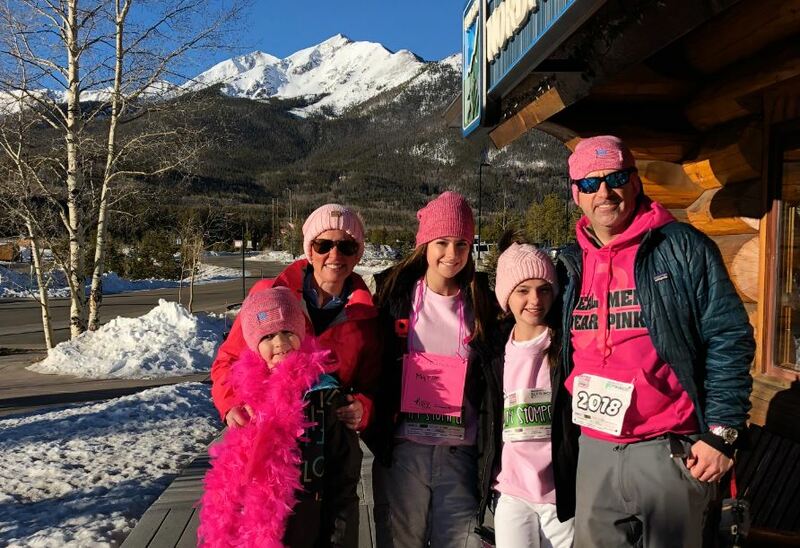 Lisa Linn with her family at 2018 Snowshoe for the Cure. Fighting breast cancer is one of the most difficult challenges a woman can face. For women who have young children and teenagers, that fight becomes more than just about the disease and one’s own life. Recent breast cancer survivor Lisa Linn talks to Susan G. Komen® Colorado about “the fight” as a mom. This Mother’s Day will be a special one for Lisa Linn and her family. It will be her first Mother’s Day as a breast cancer survivor. Last May, Linn was diagnosed with triple negative breast cancer. It was aggressive, and doctors told her she needed to act fast. “I was at the swimming pool with the kids when I found out,” Linn says. As Kennedy, 14, Harper, 11, and Cooper, 9, blissfully enjoyed the start of summer vacation, their mom was already gearing up to fight for her life and her family. Linn and her husband, Brandon, a Susan G. Komen® Colorado Pink Tie Guy, decided to wait to tell the kids about the diagnosis until they had all the facts, but that would be a couple of weeks. So Linn tried to continue life as usual for her kids. She got her daughters packed for camp and sent them off. Her son stayed behind while she secretly scheduled and went to doctor’s appointments. Like most kids, though, Cooper picked up that something was a little off. Lisa was set to begin chemotherapy while one of her daughter’s was away for a month at camp, and she didn’t want to begin treatment without her knowing. A social worker recommended the Linns tell all of their children at the same time. So they arranged to meet with Kennedy for a day at camp. Linn rehearsed what she would say to her children, and each time she would break down. But when the actual day arrived, Linn says she found a peace in herself she didn’t know was there. She describes it like the strength people muster when they lift a car off of someone during an accident. The biggest question the children had was whether their mom would live. “We told them I was on a very strong dose of chemo, and I had one of the best oncologists in the U.S. And as long as I did what they told me to do I was going to be fine,” she says. There were equal amounts of tears and hugs, but the family was ready to take on Linn’s disease. But as Linn says, no one is ever fully prepared for what fighting cancer will be like. The months that followed would be the toughest Linn would face as a mom. She was prepared to lose her hair, eyebrows, and eyelashes. But she was not prepared to lose her autonomy. The sickness and exhaustion generated from the life-saving treatment took an emotional and physical toll on her. She found herself frustrated and disheartened when simple tasks, like checking the mail, became difficult. Being unable to care for her family was even more demoralizing. “It was like being locked in a cage. I found myself very resentful. And you don’t want to be that way when people are trying to help you – you want to be grateful. But I was having the complete opposite reaction,” Linn recalls. And it did get better. Linn received a clean bill of health in December 2017, which brought her daughters to tears. And finally, she says, the sadness that once seemed to hover over her children has lifted. Linn adds their relationship is stronger than ever. At the time this story was written, Linn and her family had no concrete Mother’s Day plans.